Need a meal that’s ready in a hurry but nothing is thawed, you have no broth on hand, and you don’t own an InstaPot? Have no fear! You can make rich, nourishing soup in just over an hour with a pack of frozen meat and whatever veggies you have on hand. This ‘recipe’ can be modified based on what you have in your fridge, freezer, and pantry, as well as to your own tastes. Once you are familiar with the method on how to make this, you will find that you can whip it up with little effort and time. For the meat, you can use a pound (give or take) of any one of the following: stew cubes, shank, hock, chops, or steak. The bigger the cut or cubes, the longer it will take to cook. You can also use a cup of meat left over from a previous meal that has been cubed, but you will not need to cook it, just add the meat to the veggies one they are done. For the veg, you can use what ever you like! In our home, we always add onions, carrots, cabbage to our soup, and when we have them on hand, watermelon radish, beets, sweet potatoes, and purple top turnip. For seasoning, again it’s pretty flexible, but you will need salt. We also like to add one of our spice rubs, in this case, I used our Simon & Garfunkel seasoning that my daughter pulverized with a small grinder. The other ingredient you need will be fat. This can be rendered fat left over from a roast you’ve cooked, or rendered pork fat that we offer in jars, or even bacon fat or butter. Just don’t skimp on the fat, or you will end up with a sad, sad soup. Optional ingredients are tomato sauce, barley, or, pasta. Tomato sauce can be home made, or store-boughten. Adding barley or pasta will give the soup a nice thickness. If you are gluten free or eating keto, skip the barley or pasta, and try to use a cut of meat with bone in, and make sure you add enough fat. This will give more body to the soup as well as a velvety texture if you aren’t adding barley or pasta. Step 1. Put the frozen (or thawed) meat into a heavy bottomed pan. Add some water to the pan, seasonings you like, and the tomato sauce. Place a lid on top and boil the heck out of that meat for 40 - 60 minutes (more or less depending on the cut and if it was thawed or frozen). The smaller the meat is cut, the less cooking time that is required. If the meat is frozen, it won’t take long to thaw when you crank the heat, so then you can remove the meat and cut it smaller if you want it to cook faster. Keep an eye on the liquid level when cooking the meat, you will need to keep adding more water as the liquid boils off. If you use a cut with a bone, REMOVE THE BONES once the meat is cooked. Use tongs, everything will be hot. Cuts with bone-in will need far more cooking time than other cuts. If you are using meat that is already cooked, see the note below about that. Step 2. Whilst the meat is cooking, chop up your veggies. If you are adding barley or pasta, see the note below for when to add it. Step 3. When you are about to cut up your last vegetable, add about a 1/4 cup or more, (more is better) of fat to a heavy bottomed skillet and let it heat up. Add the chopped veggies to the fat and let them sauté a little in the fat. Once the onions are translucent, add enough water to almost cover the veg, put a lid on it and let it simmer gently until the veg are almost cooked, usually about 10 minutes, or less if the veg are cut small. Then, turn off the heat, remove the lid, and let them sit until the meat is ready. If you are adding chopped greens, put them on top of the cooked veg now, they will wilt and be ready when you add the veg to the soup pot. Now you should have time to go watch some cute kitten videos on YouTube as the meat might need another 20 minutes of cooking time. Remember to top up the liquid level on the meat as it cooks! Step 4. When the meat is tender, put the meat and broth it has made into a soup pot and add the veggies that have been sautéed. Add more salt or seasonings if desired, then serve! Barley & Pasta: For soups that have beef, lamb, veal, or pork, I like to add barley; soups with poultry, I prefer to add pasta to the soup. Adding one or the other acts as a thickener in the soup. The time to either barley or pasta it is about 10 to 30 minutes before the meat is cooked and tender. Barley will need about 20 to 30 minutes to cook, but pasta will of course need less time. If I’m making chicken noodle soup, I can add any type of pasta, but if I’m serving visiting kids that are used to Campbell’s canned soups or Lipton’s Cup’o Soup, I use spaghetti noodles that I’ve broken into small pieces. If you add barley or pasta, you will need to make sure there is enough water in the skillet for them to absorb. Gluten Free & Keto: If I’m serving anyone who is gluten free or following a keto diet, I skip the barley or pasta, and try to use a bone-in cut of meat, and lots of fat. Fat adds a velvety texture to the soup, and fat is essentially to properly digesting the nutrients in the meat and vegetables. Adding leftover meats: You can use any left over meat for this soup, but it won’t need cooking of course. Add the meat to the veggies just before they are done cooking and let the meat get well coated in the fat and flavour from the veg. 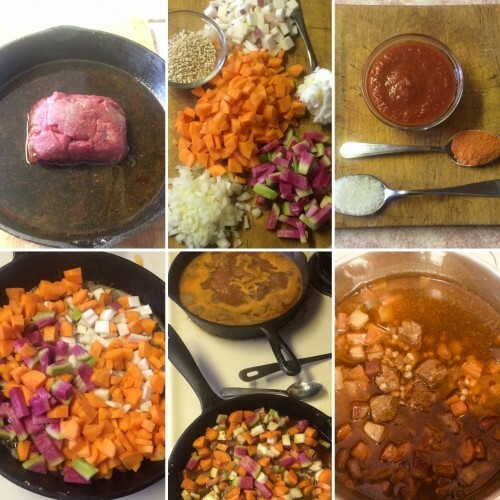 When using left over meats, you will need to add more liquid to make more soup. Again, DON’T skimp on the fat. -and then the finished soup! The soup in the picture took me 90 minutes to make because I kept stopping to take pictures and write out the recipe, and, I may have watched at least one cute kitten video on YouTube.